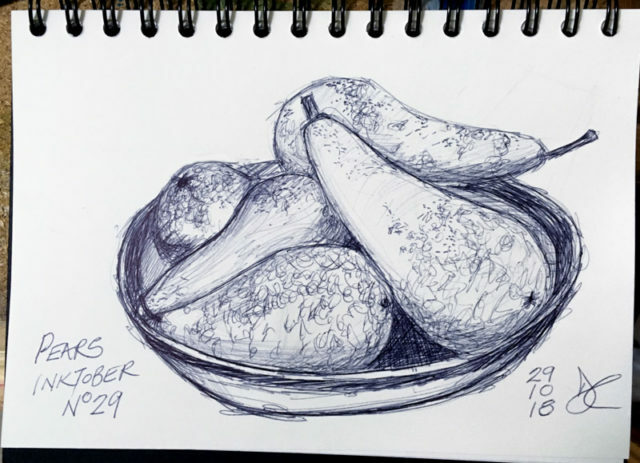 An ink sketch every day in October completed. Thirty one sketches in ten different sketchbooks, using eleven different drawing instruments. High points, low points. Days when I could have happily posted more than one and days when I could happily have postponed my sketch until the next day. Great fun certainly worth the effort of drawing in ink all the time. It may just have been the fact that you can’t erase mistakes, you just have to accept them. It may have been the opportunity to try different techniques with different types of pens I’d never have thought about drawing with before. Looking forward to the next challenge. Today was dancing day and it didn’t go well. Scamp made mistakes, I made mistakes and between us we managed to screw up, not only the Jive, but also the Waltz and the Quickstep too. Maybe we were taking ourselves too seriously, maybe we were rating ourselves too highly. Whatever it was, it was knocked out of us today. Me more than Scamp, but we both had a share. We must practise before next week. 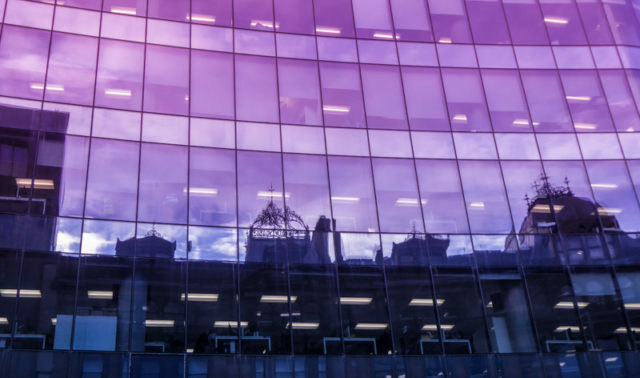 On the way home, the light was good on the big glass reflector that is 110 Queen Street and I got some clear shots of the reflections of the old sandstone buildings in it. 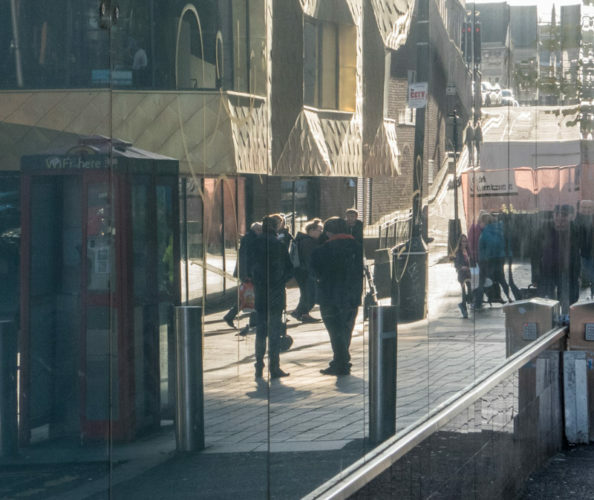 I also tried some reflections of people in the convex glass panels near the door. The building reflections eventually became PoD after some jiggery pokery in Lightroom. I’d counted the sketchbooks I’d used last night and the pens too, entering them in an Excel spreadsheet. Today I created that mysterious thing, a Pivot Table. I still don’t really know what I’m doing with it, but what I did worked and gave me a printable list of the things I needed to gather for today’s sketch. 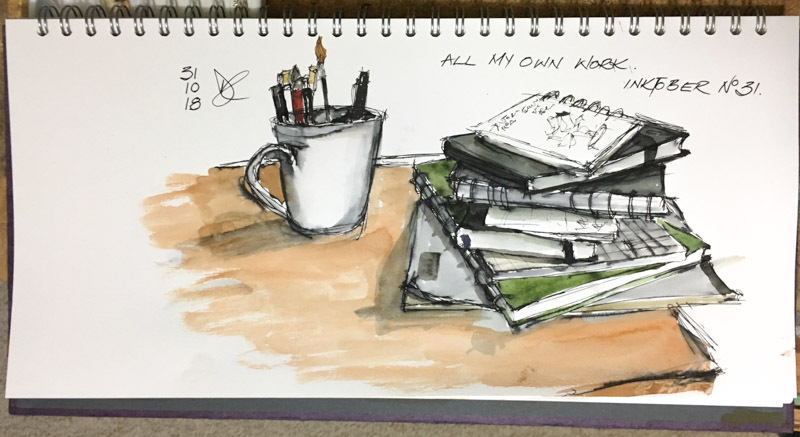 I cleared my drawing board and set up the pens in a cup and piled the sketchbooks up beside it and then set to to sketch it. 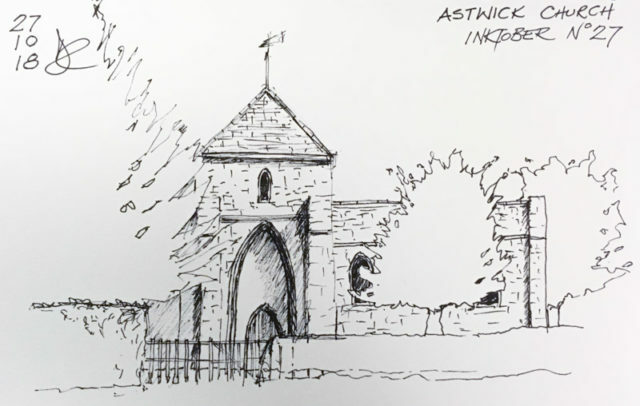 It just seemed to flow together and when the ink work was dry I started in with some watercolour, realising immediately that I hadn’t been using a water resisting ink. However, I liked the shading the ink was producing when mixed with water, and kept it. That is the final sketch in Inktober 2018. Salsa tonight was a re-run of Monday’s Halloween Party. Scamp and I won equal first place with another couple for the Dress the Mummy competition. I do hope Jamie G has a video of it, or even some photos. Great fun again. 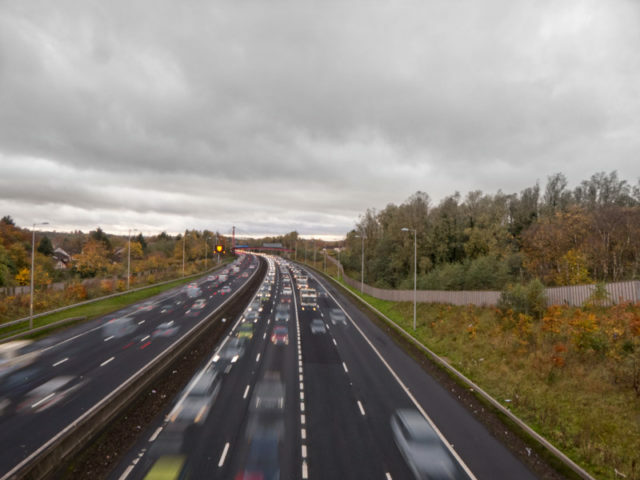 What wasn’t fun was trying to thread a way through the football traffic on our way to the STUC. I hate football traffic. That’s about it. Successes and failures today. That’s the way it goes sometimes. Tomorrow it’s coffee with Fred and Val. Looking forward to it. Today we were off to Perf. Gateway to the best coffee beans in Scotland, if not the world. Drove up to Perf on a beautiful clear morning. That said, it became a bit cloudier as we travelled north. I’d come with gifts for the Perf folk. I donate my two bike carriers to the bike shop across the road from the car park. Neither of them fit either of our cars, and are now superfluous to our needs. They were just cluttering up the house and were going to be dumped, so if someone can get the benefit of them, all the better. I also took a load of computer books to the Oxfam shop in Perf. I’ve read them and used them well, but now I usually consult the InterWeb if I’m in need of information and besides, they were well out of date. Next we had to decide what we were doing for lunch. Scamp had an Itison voucher for Cafe Tabou which is now under new ownership. We decided to give them a try and see if they’d kept up the excellent standard of the previous owners. For starter, Scamp had Roast Red Pepper Chick Pea Ragout with Tempura of Fish and I had Salad Du Chef. For main she had Breaded Plaice Fillet with Chips(!) and I had French Black Pudding & Pork Belly. She was perfectly happy with her selection, I felt the main was a bit tasteless, although the caramelised apples and cider sauce was lovely. Worth another Itison voucher some time. When we came out the streets were just drying after a heavy rain shower and you could feel that there was still a bit of rain on the breeze. After the lunch, we went for walk to get the coffee and tea that I so desperately needed. 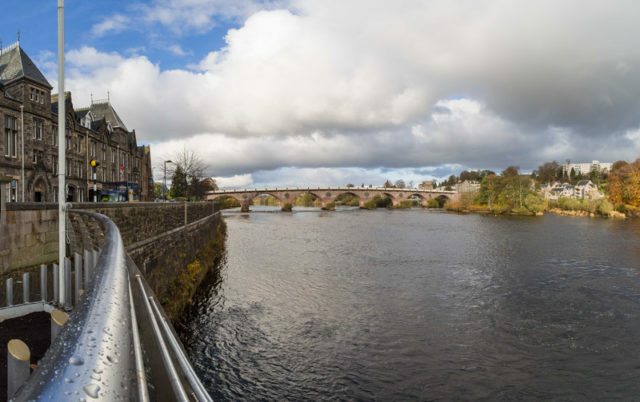 Then a walk along to the the viewing gallery over the River Tay. 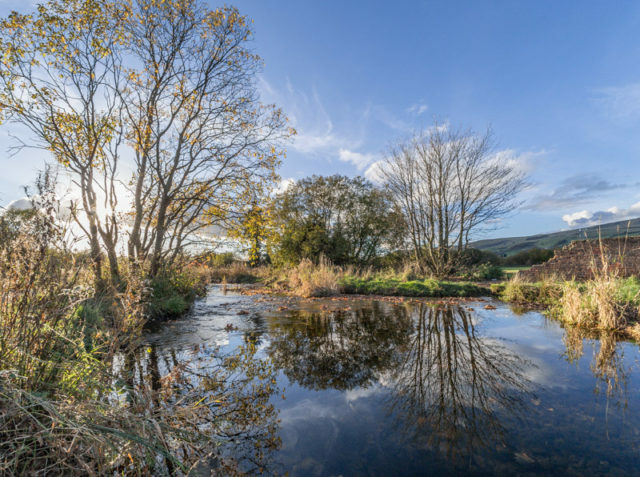 Beautiful light on the trees on the far bank and the sun was shining now on the bridge, so that became my PoD after it was de-fished (no fish were injured in the operation) and some work done on the levels. Samyang 7.5 is a really versatile lens. With the river inspected, we headed back to the car and the drive home through some beautiful light with nowhere to stop and record it. We also passed through some heavy rain showers that had probably created that beautiful light on the hills. 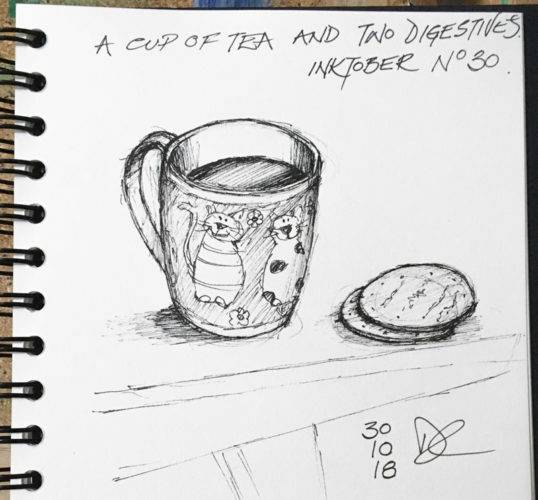 Sat and sketched my teacup and two digestive biscuits for today’s Inktober sketch. Thirty sketches in and only one left to do tomorrow. Tomorrow as I’m sure you know by now is one of those busy days with two dancing classes and the driving to get there, there’s not much time for dawdling, so I already have a plan for tomorrow’s sketch. It will need a bit of preparation, part of which I have already done with the assistance of an Excel spreadsheet. Art and computing are not the easiest bedfellows, but hopefully one will help with the other if I have my way. Tomorrow is a dancing day. Anything else will just have to fit in with that! Today I thought I’d go to the gym, or maybe a swim. Instead, I did a bit of sunbathing. Well, Sunbathing might be a bit of a stretch, but a walk in the sun, now that would be a more pleasant way to spend the afternoon rather than swimming in a crowded pool or sweating it out in the gym. That’s what I did. While Gems were being put through their paces I was making paces along the canal and across the plantation then back to the car. The light was beautiful this afternoon. One of those days with golden light. Managed to miss a lot of the good light, but also grabbed some too so I did bring some of the sunshine home with me in the little black boxes with the glass things in the front. PoD went to the one you see at the top of the page. It took a bit of post-processing which I won’t bore you with, but it went through a couple of pieces of software until I was happy with the result. Driving home I came to the roundabout at the bottom of the road to find a blue car, maybe a Ka sitting on its roof with the windscreen in smithereens an the doors wide open. A crowd round it seemed to be consoling a young asian girl who looked as if she was in shock. Not the sort of thing you see everyday! When we went out to salsa tonight I noticed that two of the steel barrier poles on the roundabout had been flattened, I presume by a flying blue car. Nobody seemed to be seriously injured, but someone was not going to have a happy Monday night. After I came home I settled down to sketch a bowl of pears that was just sitting there waiting to be recorded on paper. I was quite pleased with the way it went and decided to put it away and have a better look with a more critical eye when we came back from salsa. Tonight was Jamie Gal’s Halloween Party – for the advanced class. Some dancers who had fallen away a bit appeared to bolster our numbers and we all had a great time. Played the Hat Game. Everyone tries to grab a hat from the present wearer’s head and when the music stops the wearer gets a prize. Simple and funny. In the past it has led to fights on the dance floor with bodies rolling around shouting “IT’S MINE!”. We were a bit more restrained tonight. Jamie had a new game “Sort of ready”. Which usually means he has the gist of it, but some of the a lot of the details need ironing out. The basis of the game was that we’d dance a Rueda until somebody stopped the music, then there would be a task given out. The task was to grab a roll of toilet paper from a stack in the middle of the floor and wrap up your partner like a mummy. I thought we did well, but Thomas went just that extra mile and ended up with some toilet paper stuffed up his nose as well as being wrapped in it. Probably the best game Jamie has invented recently. He tried to film some of our legendary Dancing In The Dark Rueda with his drone, but it didn’t want to play nice tonight and I think he aborted that part. Came home and reviewed the sketch, changed some bits, but basically just cleaned it up and posted it. 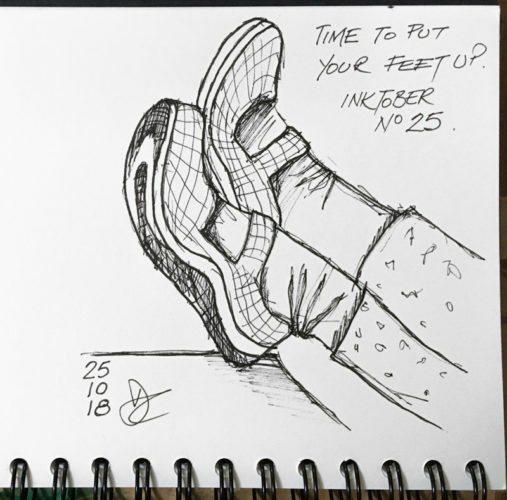 Inktober 2018 No 29 in the bag. It’s cold tonight again. Just 0.5ºc. Tomorrow we may go to Perth. British Summer Time ended at 2am this morning and I didn’t even hear it go. So we are now officially out of summer and into the autumn, if not the winter, of our discontent. Even the weather got in on the act with the temperature just managing to climb above zero this morning. Tonight, as I write this, it is dropping away again and sits at 2.1ºc. We’d half intended to go for a walk in Glasgow Green this morning, but instead we headed in the other direction and visited Asda instead with the twin purposes of buying Cream of Tartar (apparently and essential ingredient in the making of soda scones) and a Halloween tee shirt for Jamie’s Halloween Salsa class tomorrow night. We were partly successful, in that I got a tee shirt and the Cream of Tartar (is Cream of Tartan different? I just typed that by mistake) but Scamp was not impressed by any of the Halloween offerings. After lunch I went through the usual argument at this time of year: “So, if it’s twenty past ONE now, that’s really the equivalent of twenty past TWO yesterday, since the clocks went back silently this morning. And if it’s now twenty past TWO and a few seconds, I shouldn’t really be sitting here arguing with myself, I should be out in the bright sunshine taking some photos.” Scamp didn’t want to go out for a walk because she was up to her armpits in cake mixture after taking a notion to bake a cake for Gems tomorrow. I took a walk over St Mo’s suitably wrapped up in the Bergy jacket with the zipped in lining and a warm hat. I wish I’d also taken a warm scarf, but at least I’d the forethought to stuff a pair of gloves in my pocket. The remains of yesterday’s Halloween party were scattered around. Pumpkins everywhere. I’d expected them to be almost completely destroyed by now after having been booted around the park, but no, they were neatly piled up with their toothy grins smiling at passers by. 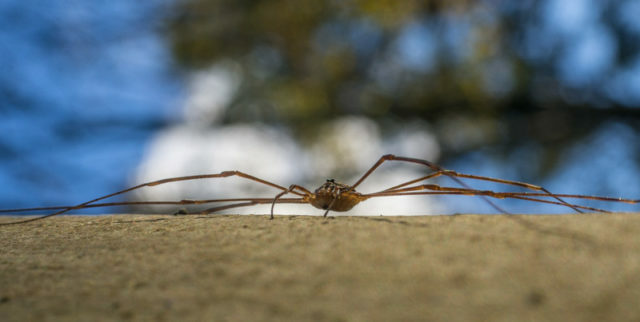 Got a few photos of them, but PoD turned out to be a Harvestman arachnid (NOT a spider). Anyway, the Harvestman made it to the PoD. By the time I came back home the temperature was definitely dropping away as the sun was also dropping below the horizon. Such short days at this time of year. Today’s Inktober sketch, No 28 is of chillies. It might be because of the curry we had for dinner that was just a wee bit hot. It might be because it’s been a chilly day with the temperature not rising much above 5ºc. 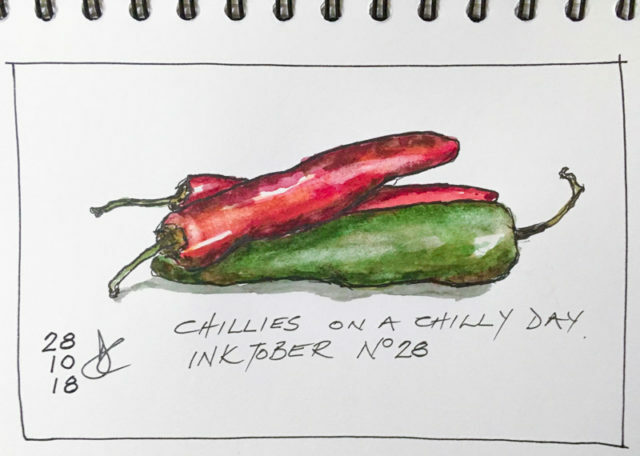 Anyway, it’s chillies for a chilly day. Tomorrow is a Gems day. I may go to the gym. Too cold for cycling I fear. Got the fast bus in to Glasgow, well the sort of fast bus. Certainly not the slow bus anyway. Wandered round JL looking at kettles! Such exciting lives we live. Then a leisurely walk down Bucky Street so Scamp could buy some Christmas prezzies (spoiler alert! None of them were kettles!). Outside the shop there was a bloke busking. When we came out, the song he was singing sounded like one by Phil Campbell and his singing was like Phil Campbell too. I’m still not sure, but it could have been him. Got the subway to Kelvinbridge and walked up to Paesano. Had our favourite pizzas. No1 for Scamp: plain pizza with sugo, added rocket and no garlic (no cheese). For me it was a straight No5. We even had an ice cream each to finish (on the coldest day since April). Bumped into Dr Barbara and Callum with the boys in Paesano. Got the train back into town and went in to JL and bought a kettle! When we got home I took a walk to St Mo’s and there was a fair buzz about the place. Lots of groups setting up stalls and things. I think it must have been from the Secondary school. Everything with a Halloween theme of course! Pumpkins spread all along the boardwalk and the seat in the park covered in fake spiderweb and covered in giant spiders. I got a few shots although the light was really low by that time. PoD, however came from the Teazer in Glasgow. A reflection in a shop window. 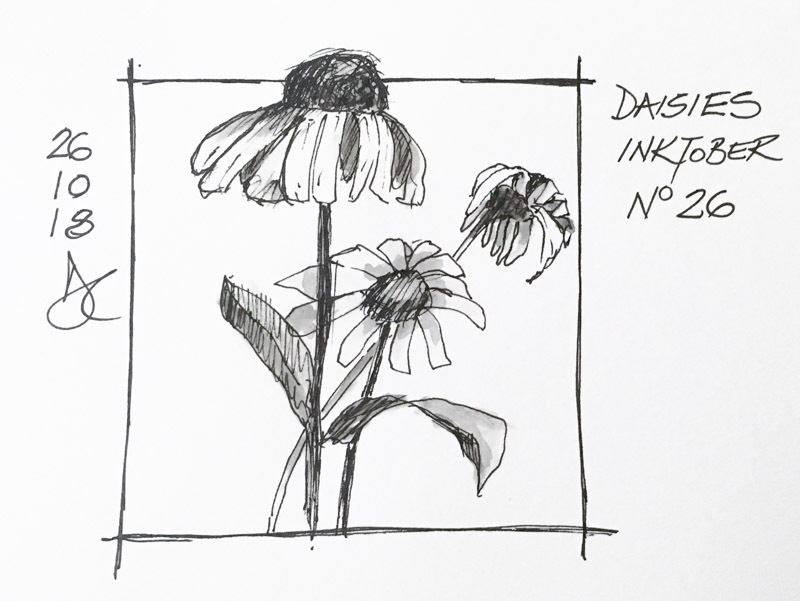 Today’s sketch was another from the photograph library. 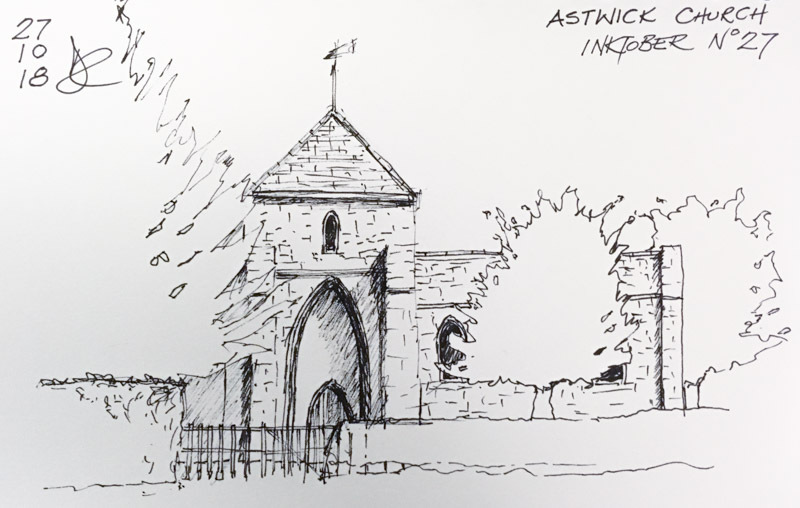 It came from 2017 and is the church across the fields from JIC and Sim. Slightly better than a place marker, but not by much. Must try to get more sketching done outside in the real world. 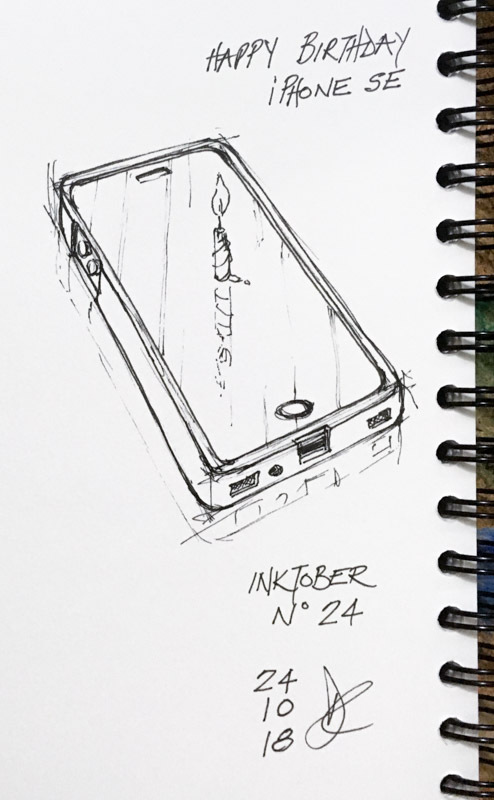 Only four more days in Inktober 2018. Tomorrow we have no plans. It’s a long time since I’ve been able to say that. Not quite as far as China or Japan, but certainly a different land. South Queensferry was Scamp’s choice of destination today, so that’s where we went. Not quite as far as Embra, but just on the edge of the capital city. It does look like a different country and probably a different era too. Narrow winding streets and cobble stone roads. For once we got parked with not problem in fact I had to check to make sure it was still free parking. It was. The low light was really bright and the sky was blue. We went for a walk. We walked through the town and had lunch in Scamp’s favourite restaurant. My burger was a bit dry and needed some salt. The chips were excellent and I had to ration myself. Scamp’s Fish ’n’ Chips looked lovely and the wee bit she gave me to taste was indeed delicious. Thin tasty batter, not overdone as it sometimes is. 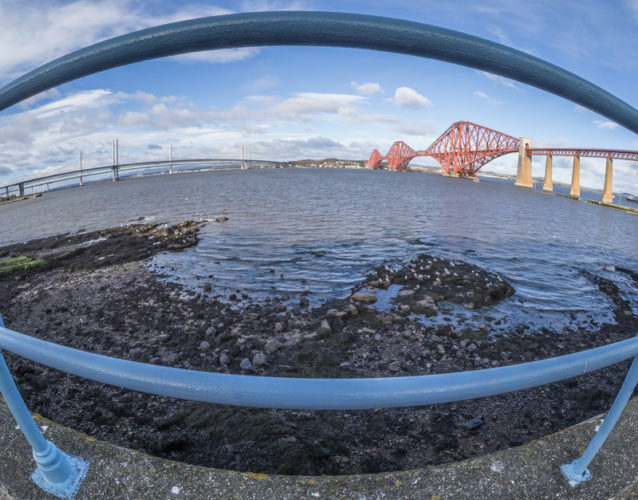 Took a few photos with the Samyang to get the wide look through the narrow closes down to the sea, but finally settled on a Samyang shot through the handrail at the carpark that allowed me to capture all three bridges in the same frame as PoD. 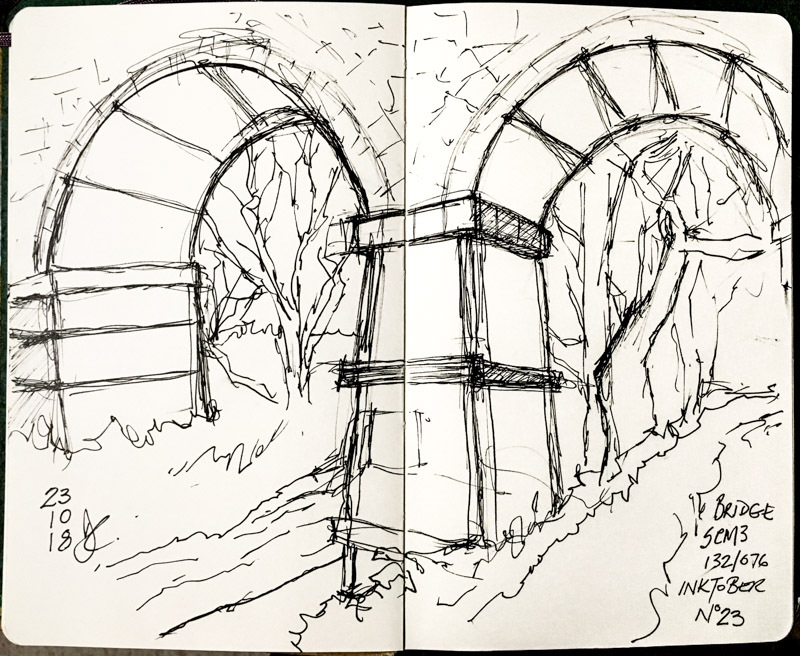 Couldn’t settle on an Inktober sketch and finally copied and simplified a photograph I’d taken in St Mo’s away back in the heady days of summer. Remember summer? I quite liked the finished article. Tomorrow we may be going to Glasgow, again, but this time for a pizza lunch. Scamp was out singing this afternoon. I decided not to go and upstage her. A relaxing afternoon waiting for the rain to stop. It didn’t. Instead, I tidied up the mess I’d left after shooting yesterday’s shot. After that I wandered around for a while and eventually sat down and watched my next episode of Trust. The story’s really well acted and even although it’s not totally true, parts being fictionalised, it still feels like a documentary. That’s enhanced by the Italians speaking in their own language with subtitles for us non Italian speakers. I know Scamp isn’t keen on Trust – it is a bit bloodthirsty. I think I enjoy it because I’ve lived through this story, I remember it all happening. I was just settling in to the story when the singer returned, flushed with success. I decided to risk the rain and go for a walk instead of sitting around for the rest of the afternoon. The light was failing again as I went out, just like yesterday. Today, however, I was determined to get an outside photo. I got the makings of one and a shot of my old friend Mr Grey, standing on a stone in the middle of St Mo’s pond waiting for his supper to swim past. Mr Grey is a grey heron. After dinner I started on the post processing. An hour or so and three different editors later I had my photo. 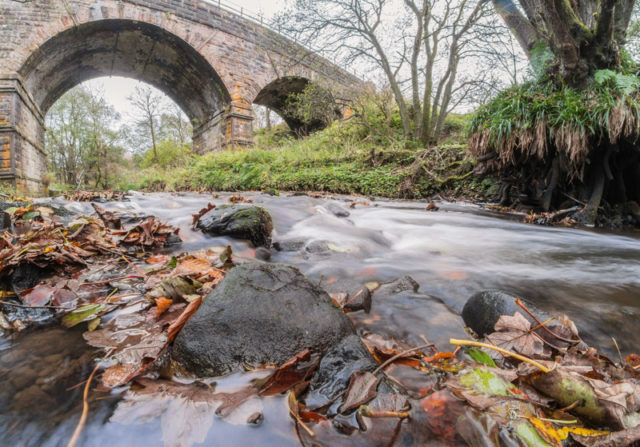 It needed: Photoshop to create and blend the stack of photos, ON1 to work on the levels and colours and Lightroom to do the final tweaks and get rid of the rain drops that ended up on the lens. Struggled to draw a decent drawing of my TZ70, The Teazer, for Inktober No 25. I had drawn it for last year’s Inktober and wasn’t really happy with another repeat. Basically my heart wasn’t in it, but it wasn’t until Scamp, my most honest critic commented that it looked a bit flat that I decided to leave it and start something new. Then I saw her feet in her fancy slippers resting on the corner of the coffee table. Draw what’s in front of you. That started out as my maxim this year and that’s what I did. Yes, there are mistakes, but I like the simplicity of the sketch and the fact that it was completed in about 15 minutes. It worked and it wasn’t flat. It got the Scamp Seal of Approval and that’s good enough for me! It’s been a dull day with a (very) few bright intervals but we are going to have much brighter weather soon. Brighter but much colder with winds blowing out of the north, straight from the Norwegian Sea. That’s what the weather pixies tell us. Hard frost on Sunday night. Hmm, I don’t like the sound of that. Tomorrow, it’s Dentist Day 3 for Scamp. Let’s hope it’s third time lucky. Title comes from a Petula Clark song (Google her). Didn’t sleep well last night. Partly my own fault for finally dragging myself up the stairs long after midnight. Tonight I’m hoping to be a bit earlier. Intended getting the train in to Glasgow today, but there were no spaces in the carpark at the station, so there was nothing for it but to drive there. Had a bit of a scare in the multi carpark. I seemed to lose drive, reversing into a space. Helluva shuddering coming from the car too. Finally gave up and drove up to higher floor and parked without problem. Finally sorted it out in my head. The floor in the multi is paint concrete and the space I was reversing into was directly opposite to where they wash the cars. I presume some of the detergent had got on to the roadway, either that or some wax and the anti-skid had kicked in on the Juke. It hasn’t done anything like that before or since. Walked down through the film stage that is Glasgow city centre this week. They are filming part of the Fast and Furious franchise. It certainly seemed to bring a load of spectators out to watch the fun. We were going to ask if they needed any dancers, but we didn’t really have the time. Jive was good, except we didn’t get a chance to show off our ‘Timesteps’ routine because we were on to a new set of move. Waltz was good and we got some tips on how to smooth it out more. Quickstep as working too. It’s all definitely getting better. We seemed to get the thumbs up from Michael for our efforts. Much happier today. Drove home, and as I said never noticed any problems, so the detergent theory seems likely. Couldn’t be bothered going out to take photos when we got back and anyway, the light was disappearing fast. Must check the sunset times tomorrow. 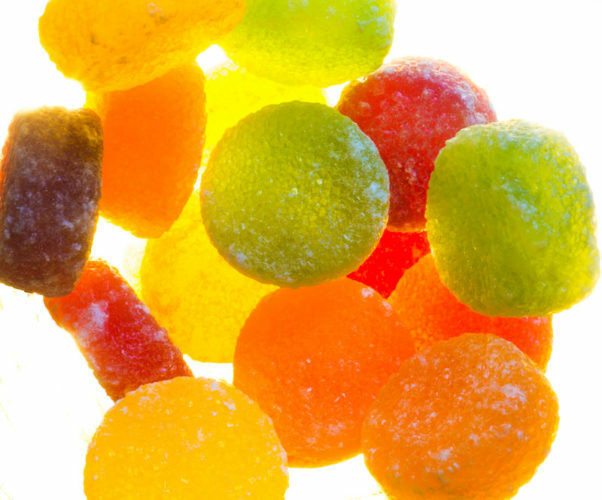 Finally decided to do a tabletop shot of pastilles bottom lit by an LED lamp. Quite liked it. Took a long time to set up, but didn’t need so much post-processing. Salsa tonight was interesting. Working with the level 4 class and they were doing Ellie, Ceo and an old one, Cambio. I’d forgotten that one. Scamp thinks there will be another amalgamation of classes. Most of the 6.30 class could join the 7.30 class without too much difficulty. 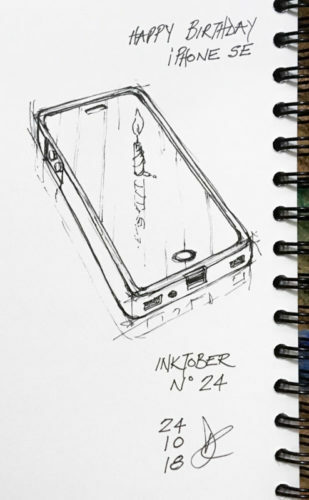 Inktober sketch is of my iPhone SE. It’s not the best, but it’s done …. Tomorrow Scamp has a gig. I may go for a walk if the light is decent and I can gee myself. Windy Willy was whirling past the house this morning. Willy went to bother some other folks in the afternoon, but has returned to blow on us this evening. You can make it using your own ingredients, but the basic Acid, Sugar, Salt, Flavouring mix works well. There’s probably a Phd Chemist who could explain why it works 😉 but I’m not really bothered, it just works for me. I put the marinade into a poly bag, shook it a bit to make everything mix properly and then dumped the meat in it and left it to rest in the fridge for an hour. While I was waiting for the marinade to work its magic, I baked a pizza from a bit of dough I’d taken from the freezer with the meat. Pizza wasn’t startling, but it did for lunch. I’d also brought some dough from the freezer, so I baked that into a loaf. When it was done I fried the meat in some oil in the Le Creuse, added some chopped onion and a chopped pepper then put the lid on an put it in the oven and turned the gas down to gas 3. It worked away at that for an hour or so before I turned it down and added some water and a chopped carrot. Lots of work, but fairly easy work. Scamp wasn’t for going out, so I went out for a walk along the Luggie and that’s where PoD came from. Slow shutter speed this time. No complicated Photoshop actions and scripts. Must look for a decent pair of boots. My usual boots have no grip in muddy clay and they’re beginning to leak. 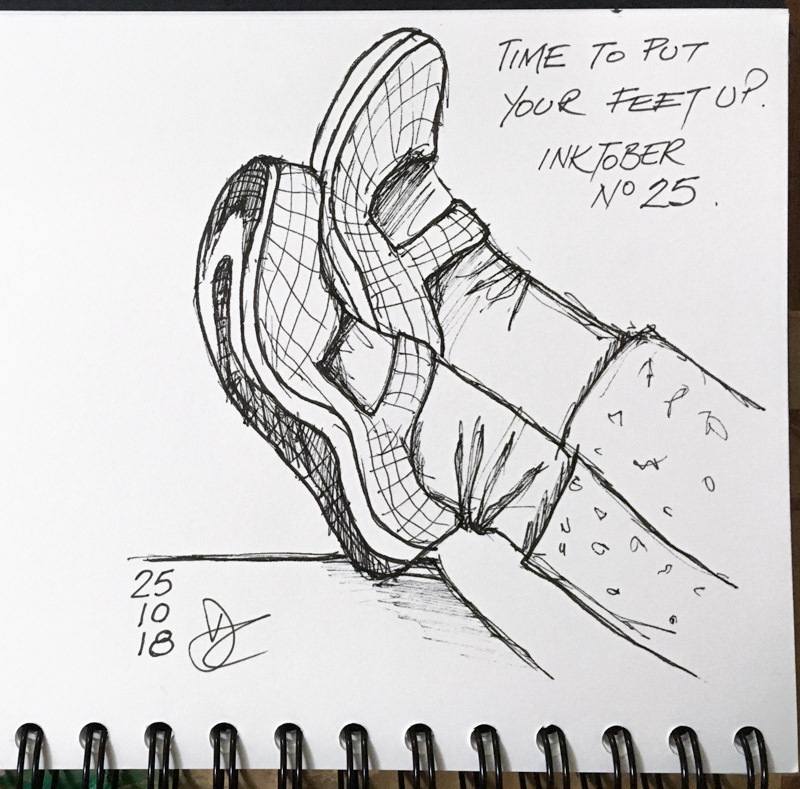 Also got Inktober 23 done. It wasn’t until I came home that I realised that I’d drawn the exact same sketch before. Finally found it on Flickr. It was drawn in July last year. Hopefully, tomorrow we’ll be dancing if we can get past the closed streets because Hollywood is coming to Glasgow! Email and printers. The most difficult and flakiest things to set up. Look at them the wrong way and they just refuse to work. The email account I fixed this morning seems to still be working. Sent my brother an email tonight and it hasn’t bounced yet. I hate setting up email accounts and printers. They are the most hated things to get going right first time. Yes, things are getting better and the wireless printers are a dream to set up now, but even they still have hissy fits sometimes. Today was Gems day, so after all that technology overload this morning and after getting our flu jags and after buying Tesco I packed my bag and went for a swim. I had thought of going for some exercise first, but instead I sat in the steam room for quarter of an hour, then swam for another twenty minutes. Five minutes is enough for me in the sauna thankfully now with its door back on its hinges. Then a shower and a word with old Bob who probably lives in the changing room. I’ve seen him sitting with his lunch and a flask of tea a couple of times! Still, he’s paying his money the same as us and making the most of it. He tells some tall and wonderful stories at times. David Beckham was his topic today. I get the impression he doesn’t like the man! Came home and doodled a sketch of a concrete and wood park bench from one of my photos. It took me two tries to get it right and when it was done it looked really smart … if you ignored the ghost bench beside it which was a bit squint and out of proportion. Went out for a walk in St Mo’s to try to catch the last of the light and maybe have a look at that bench again. Never did get a look at it. Instead I found some bright red bramble leaves and disturbed a long legged spider then tried a low shot of some leaves. They’re much thicker on the ground this year, I think. Leaves that is, not spiders. 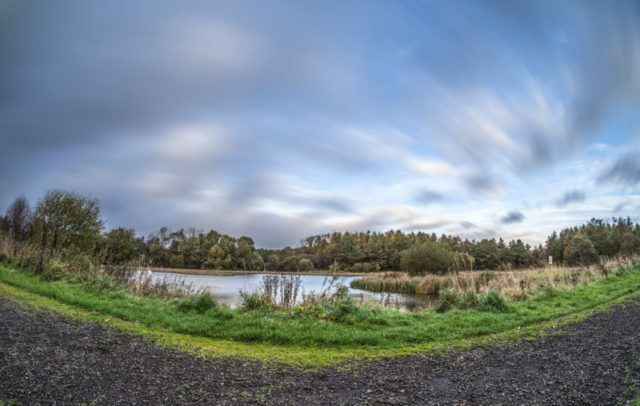 Eventually settled on a ten shot view across the loch with the camera sitting on a (different) bench. The ten shots were the raw material for an idea I had. Wind was strong and gusty and the clouds were scudding across the sky. That was the reason for the 10 shots. Came home and downloaded the images. Cleaned up the ten shots in Lightroom, then exported them to a temporary folder. Imported them from there into a ‘stack’ in Photoshop. A stack is basically one image made up of a number of layers. Ran a script called “Image Averaging Layers” in Photoshop which does a very clever blending of the layers in the stack. With that done I selected the sky and water area with the Colour Range selector tool, Inverted the selection and proceeded to delete all the ground areas except one. That one I duplicated, reset the opacity to 100%, inverted the selection again and deleted the sky from that one. Bingo. My work was done in Photoshop. Saved it off and then flattened the image. Saved it again with a different name and imported that back into Lightroom where I could do all the usual twiddly bits. Now all that previous bit was to remind me how I did the moving sky, but the solid ground and trees. Hopefully I’ll find this some day when I’m stuck. No dancing tonight because Jamie G is off on his travels again and also we were waiting for a call from Hazy to see how ND was. Turns out he was getting home tonight. Although his ailment was serious enough, it wasn’t as bad as initially feared. Back home in Hazy’s tender care, I’m sure he’ll be on his feet again soon. 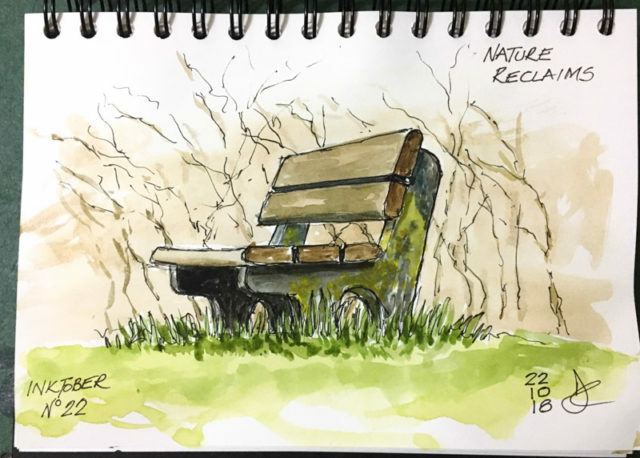 Tonight I did another Ink and Watercolour sketch of that park bench. It’s not as good as the first one. A second sketch never is in my opinion, but at least it doesn’t have a ghost bench intruding into its space. So, basically everything is back on an even keel again, fingers crossed. Maybe going for a curry tomorrow.